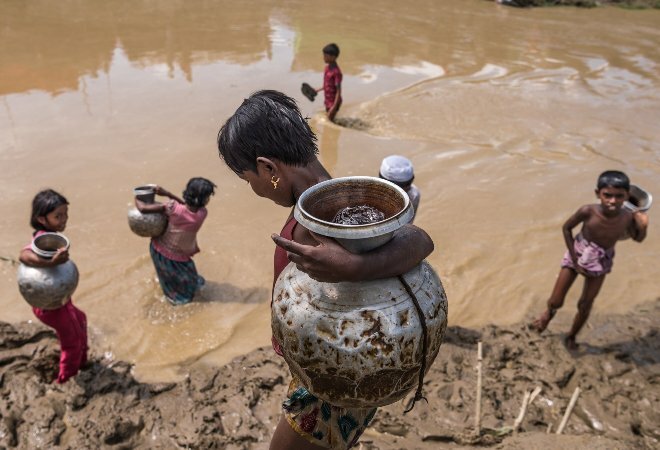 According to the latest figures from the World Health Organisation (WHO), 62 per cent of water available to households of the Rohingya camps in Cox's bazar is contaminated with the possibility of having high levels E.coli. UNICEF spokesperson Christophe Boulierac came up with this data on Tuesday at the regular press briefing in Geneva, UNICEF reported. "We are also concerned by an increase in cases of acute watery diarrhoea (AWD) which have included several deaths," he added. Between 25 August and 11 November 2017, a total of 36,096 AWD cases were reported, including 10 related deaths- 42 per cent or 15,206 of which were children under age five. "We are seeing an upward trend in infection rates. Whilst the exact cause of increased cases of AWD remains uncertain, it may be linked to contaminated food or water, Boulierac elaborated. "Contamination may be being caused through poor hygiene practices, such as the use of dirty containers, bad hygiene habits of the population in water handling," the spokesperson said. "We are stepping up measures to distribute water purification tablets to provide for water treatment at the household level as well as promoting good hygiene practices," he said, noting that providing safe drinking water has been one of UNICEF's highest priorities in responding to the Rohingya refugees' needs. Since August 25, some 622,000 refugees fleeing violence in Myanmar have sought refuge in Cox's Bazar - bringing the total number of refugees there to an estimated 834,000. As international attention focuses on the main Kutupalong and Balukhali settlements, the thousands who have settled in smaller villages in the southern part of the district risk being excluded from humanitarian aid programmes, the International Organisation for Migration (IOM) said. Although most are in the main settlements, 22,067 refugees live in Shamlapur, with 16 people sharing one latrine that are mostly full or dangerous; 22,130 in Leda, which has only one latrine per 47 people - well below the humanitarian 'Sphere' standard of one per 20 people; and 29,915 in Unchiprang, where there is also only one well per 57 people. This totals more 74,000 Rohingya refugees in all. IOM emergency managers say that the three sites urgently need to be developed, including providing vital infrastructure - access roads, lighting and waste management. "Most of the temporary pit latrines are full. With little to no land for de-sludging, they are becoming unusable and a danger to communities living nearby," said IOM WASH specialist Stephen Waswa Otieno.